Introduced species are a major threat to coastal ecosystems worldwide. Thus, understanding biotic resistance (i.e. 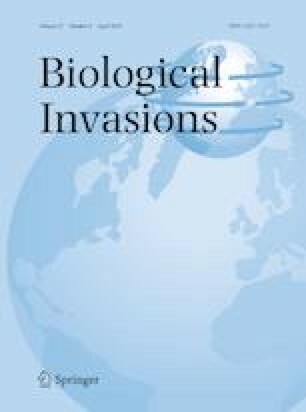 the ability of native species to limit introduced species) is a central goal of invasion biology. This paper examines mechanisms underlying biotic resistance. Consumption can limit introduced prey provided that native predators prefer such prey. Furthermore, predator nonconsumptive effects (NCEs), mediated through predator-released cues perceived by prey, can limit prey recruitment, a key demographic process for prey populations. However, information on predator NCEs is largely absent in the context of recruitment in introduced prey. Working on the Pacific coast of Hokkaido (Japan), we addressed this knowledge gap using native predatory dogwhelks (Nucella lima) that prey on native barnacles (Chthamalus dalli) and introduced barnacles (Balanus glandula). We experimentally examined dogwhelk preferences for barnacles in the laboratory and dogwhelk NCEs on barnacle recruitment in the field. We found that N. lima preferred B. glandula over C. dalli, likely as B. glandula prey is more profitable, as suggested by previous findings in congeneric dogwhelks. Moreover, we found that N. lima NCEs limited recruit density in C. dalli and B. glandula, likely as barnacle larvae moved away from dogwhelk cues to reduce future predation risk. Our study suggests that predator prey preferences and predator nonconsumptive limitation of prey recruitment are two mechanisms that can contribute to predator-driven biotic resistance against introduced prey. We thank Mr. Hamano S. and Mr. Katsuragawa H. for field assistance, the Associate Editor and six anonymous reviewers for commenting on earlier manuscript versions. This project was funded through a Kiritappushitugen Gakujutsu Kenkyu Shien grant awarded to T. Y., and through a German Academic Exchange Service (DAAD) postdoctoral scholarship awarded to J. A. E. The authors have declared that no conflict of interests exists.